Elvis Week Day 3: Where is Elvis in Memphis? Memphis music history runs thicker than the barbecue sauce at Marlowe’s. Thankfully fans have the opportunity to sink their teeth into several historical music experiences and walk away with mouthfuls of blues, rock and soul knowledge. For Elvis lovers, there are plenty of kingly nibbles along the way. Yesterday I took to the streets to explore a trio of museums specializing in Memphian music lore. While I have a great appreciation and love for all of the music that sprang out of the Bluff City, it is Elvis Week after all. My Presley radar continues running full tilt. 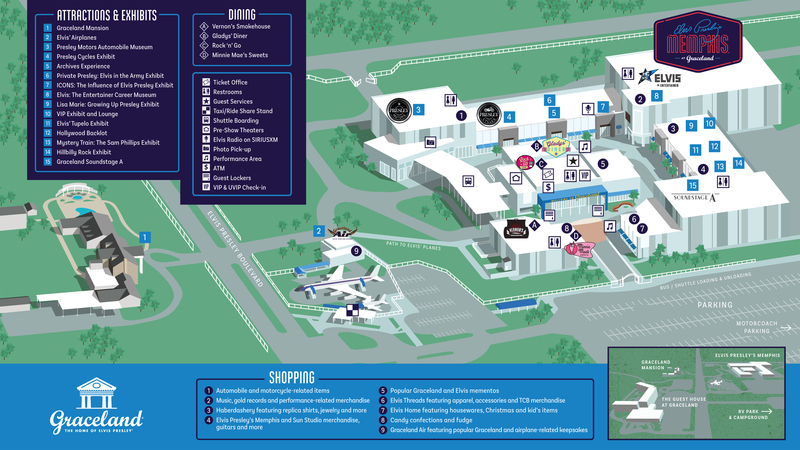 To help steer Elvis Week fans along the way, I’m listing my top three Elvis finds at each location. Thanks to its visionary original owner, Sam Phillips, the hallowed halls of Sun Studio captured world-changing music for the masses. The Jackie Brenston and his Delta Cats tune “Rocket 88,” which many historians cite as the first rock 'n' roll song, was cut there. Phillips tracked blues icons Howlin’ Wolf, B.B. King, Rufus Thomas and others. And his label’s roster beamed brightly with the likes of Carl Perkins, Johnny Cash and Jerry Lee Lewis. Of course it’s where the world first discovered Elvis, who obviously made the most noise out of all of Sun’s alumni. The Sun Studio tour begins upstairs where glass cases spotlight a collection of memorabilia. Elvis fans should gravitate to the back right corner of the room where you can discover a sizable shrine to the young king. You’ll find the black Lansky Brothers sports coat Elvis wore on “The Dorsey Brothers Stage Show” in 1956, as well as the guitar case, complete with cow hide interior, that he used. Dewey Phillips, the groundbreaking Memphis DJ, was the man who spun Elvis for the very first time. His show “Red, Hot and Blue” aired on WHBQ, and his actual DJ booth was rescued from the now defunct Hotel Chisca. It now lives upstairs at Sun. Take a look at the turntables that changed the face of music. Stand in the footsteps of the king and sing from the very same microphone. Step into the intimate recording studio that shook the foundations of popular music. Look to the ceiling, and you’ll see the same tiles Elvis saw that legendary night in 1954 when he recorded “That’s All Right” with Scotty Moore and Bill Black. On the ground you’ll see three x’s, each showing the spots where Elvis, Scotty and Bill stood during the session. Get your cameras ready. At the end of the tour, you can pose with a mic Elvis actually sang into. Affiliated with the Smithsonian Institution, this all-encompassing Memphis music museum explores the incredibly influential sounds that came out of this town. Guests get schooled on singing sharecroppers, the Beale Street scene, and inspiring artists from labels such as Hi Records, Stax and Sun. Look for the jukeboxes located throughout the museum. That’s where you’ll find instructions on how to use your tour headset to listen to certain Memphis-bred tunes in their entirety. We all know 1956 was a banner year for Elvis, and he shot out of the gate in January of that year with the release of “Heartbreak Hotel.” Get an eye load of the song’s original typed lyrics written by Mae Axton and Thomas Durden. 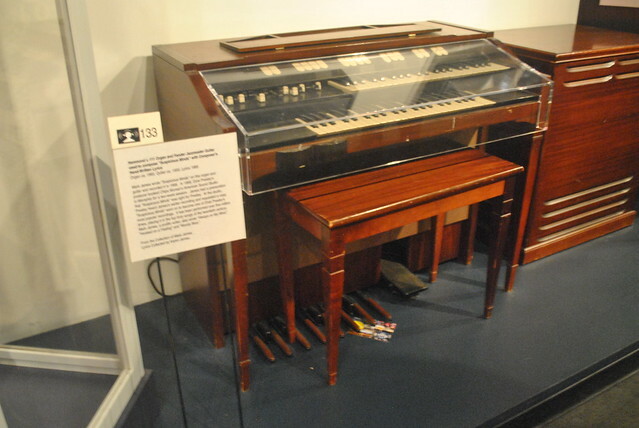 The original organ Mark James wrote the lyrics to "Suspicious Minds" is featured inside the Memphis Rock 'n' Soul Museum. Mark James, who penned “Suspicious Minds,” wrote the song while tickling the keys of a 1965 Hammond L-111 organ. You can see that very organ, as well as the song’s handwritten lyrics. Sun owner Sam Phillips snagged those legendary sounds thanks to his on-site equipment. Without it, we would’ve never heard Elvis’s voice in the early ’50s. Pay your respect to those glorious electronics. Stax Museum of American Soul Music is home to the greatest soul recordings of all time. Otis Redding, Sam & Dave, Issac Hayes, Booker T. & the MG’s and The Staple Singers are just a few of the artists that put Stax Records on the map. 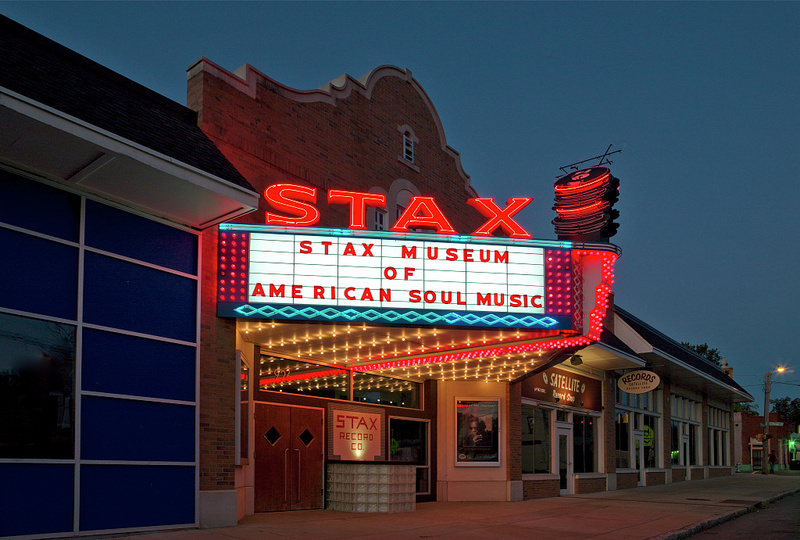 Also known as Soulsville U.S.A., Stax was unique in the fact it was a totally integrated company, from the artists all the way to the top of the corporate ladder. Although Elvis wasn’t on the label, he cut tracks at Stax in 1973. Last year’s “Elvis At Stax” box set chronicles the king’s entire 12-day Stax recording sessions. You can learn about all of that and more with a trip to the Stax Museum. The museum also supports the nonprofit Stax Music Academy and The Soulsville Charter School, which services more than 750 children. Although the original Stax building burned down in 1989, the studio was recreated to exact specifications. Guests can stand in the revived Studio A, the spot where the king’s sessions took place. It’s where he recorded “Promised Land,” “Raised On Rock,” “If You Talk in Your Sleep” and many others. Trumpet player Wayne Jackson, one half of the legendary Memphis Horns, is no stranger to Stax. He appeared on nearly every Stax recording that included a horn section. Jackson also lent his mad horn skills to “Suspicious Minds” and “In the Ghetto.” These days he’s offering personal Stax Museum tours. Hear his Elvis stories straight from the source. 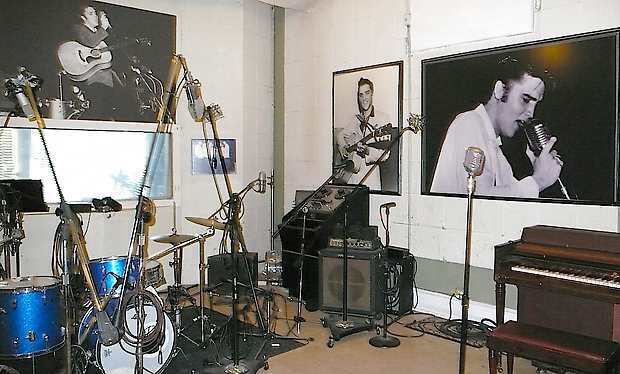 The tour can include cocktails at Jackson’s condo where he’ll show you the monogrammed guitar pick Elvis gave him during the recording sessions. Sure, they’re best known for the award-winning ribs, but the restaurant’s love for Elvis trickles all the way down to its dessert menu. Instead of taking it easy and offering a fried peanut butter and banana sandwich, Marlowe’s gets creative. They morph the concept into the Crispy Creme Banana Foster Sundae by smothering a doughnut with sauteed banana slices, globs of vanilla ice cream, peanut butter sauce and whipped cream. It’ll make you want to throw caloric caution to the wind and eat dessert first. Last night at Graceland’s Main Stage, fans gathered for a screening of “Jailhouse Rock” followed by an all-Elvis dance party. Elvis Radio’s Argo helmed the decks, while fans cut serious rug. I wrangled a few of them to find out what Elvis tunes make them wanna move. Max McNeil from Bismark, N.D. Song: “Jailhouse Rock.” It’s my favorite. I listen to it the most, because it’s fast and gets me pumped up. Also, be sure to check out Memphis Jones' video recap of the day below or check out more photos, videos and blogs by visiting ElvisWeek.com.